The former executive editor of the New York Times is denying accusations she plagiarized parts of her new book, Merchants of Truth: The Business of News and the Fight for Facts. 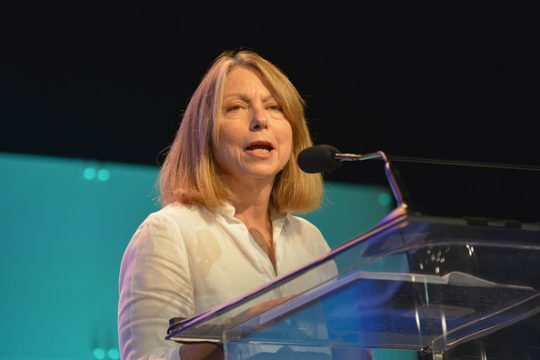 Jill Abramson said she had no comment when asked about the allegations during a Wednesday appearance on Fox News's "The Story with Martha MacCallum," the Washington Post reports. "All I can tell you is I certainly didn’t plagiarize in my book, and there’s 70 pages of footnotes showing where I got the information," Abramson added. Vice News correspondent Michael C. Moynihan laid out the allegations on Twitter. Moynihan highlighted similarities between excerpts from Abramson's book and excerpts from the Ryerson Review of Journalism, Time Out magazine, the New Yorker, and other sources. Moynihan claimed there are "plenty more" examples that he did not include in the thread, including "enormous factual errors, other cribbed passages, single or unsourced claims." There’s plenty more–enormous factual errors, other cribbed passages, single or unsourced claims–but this should give a sense. "Many people from Vice have been taking issue with the book," Abramson said on Fox News. "I think they don’t like the portrayal of Vice, although I think it’s a very balanced portrait and I have a lot of praise for some of their journalists and some of their stories. I like their fresh approach to news." Freelance journalist Ian Frisch claimed Abramson also plagiarized from a profile he wrote about Vice contributing editor Thomas Morton. Frisch included several other examples in his thread. Cary Goldstein, executive vice president of publicity at Simon & Schuster, which published Abramson's book, said the publisher would make changes if necessary. "If upon further examination changes or attributions are deemed necessary we stand ready to work with the author in making those revisions," Goldstein said in a statement. Later in the night Wednesday, Abramson said she takes "seriously the issues raised and will review the passages in question." This entry was posted in Culture and tagged Media, New York Times. Bookmark the permalink.